Virginia & Truckee flat car No. 162 was built as No. 338, one on 12 new flat cars constructed in 1891 at the Carson City shops. The 12 flat cars were constructed of new wood, but with trucks and hardware from earlier dismantled V&T flat cars. Out shopped on February 2, 1891, flat car No. 338 weighed 15,500 pounds and had a capacity of 12 tons. The car was equipped with link and pin couplers, and was painted red with white lettering. Sams semiautomatic couplers and Westinghouse air brakes were added in 1898. In 1901, the body was raised to meet the ICC standard coupler height of 34 1/2 inches. Tower automatic couplers replaced the Sams couplers in 1902. The V&T retired several of their old flat cars in 1902, and renumbered the remaining good flat cars into the Second Series (SS) Flat Car Roster, with flat car No. 338 becoming SS flat car No. 162. Between 1902 and 1912, grab irons, handholds, and steps were added to meet the newer ICC safety requirements. In 1917, SS flat car No. 162 was renumbered to SS flat car 140, and retained that number until being sold to Paramount Pictures Inc. in 1938 for $75.00. The car appeared in the movie "Union Pacific" as UP flat car No. 943. Paramount sold the car to the State of Nevada in 1971. 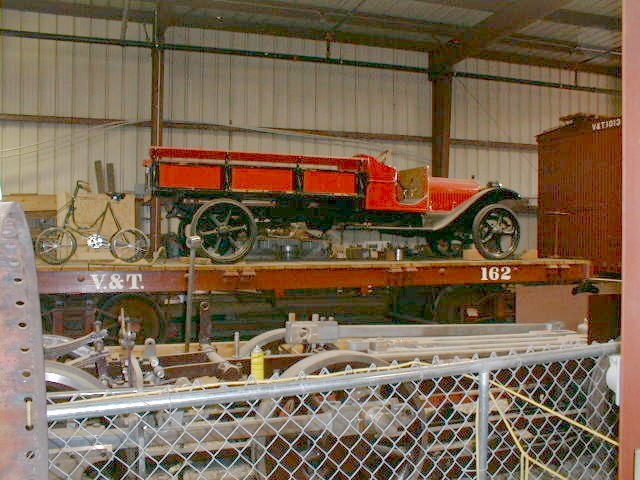 The car has been restored to its 1905 appearance as SS flat car No. 162, and is currently on display at the Nevada State Railroad Museum.